What's Next for Roadtrip-'62 ™ ? Hello again, Don Milne, your ROADTRIP-'62 ™ traveler, greeting you today from the end of our first journey. We’ve reached Jacksonville, Florida after traveling 1444 miles from our beginning point in Mackinaw City, Michigan. This twenty-day trip was accomplished with very little freeway driving, just as it would have been in 1962. And, we tried to do and see what we could from 1962. I’m sure you noticed that some things, such as eating, finding gasoline, and arranging our overnight stays, were rather difficult. There’s a lot of 1962 that’s missing today, as we Americans like to build new things. I hope that if you saw anything you liked, that you will get out on the road and enjoy it in for yourself. A virtual roadtrip may be fun, but there's nothing like the real thing! And, don’t forget to go back and click on an underlined word in any of these episodes to learn more about the places on the trip. Well, it’s time to wrap up our first journey. Let’s have breakfast at Dave’s Diner while we talk about the trip. I’m told they make some really fluffy omelets, and if you want one last southern style meal, try them with the grits on the side. The place looks like it’s been here forever, with retro touches, so it may actually be old. Speaking of old, what did we see on our journey? We managed to see old roads, buildings, listen to old music and watch old TV shows. We saw lots of natural features that have been around since long before 1962. We stayed at old places, ate some old-fashioned foods and even bought some antiques. We crossed many other US-numbered routes: just how many was it? We read about history and if you want to read more about what happened in 1962, check out some of our other pages here at ROADTRIP-'62 ™ . The Archives is a great place to find a subject that interests you. And we’ve reached the end of US-23, which today is at an entrance ramp to the Matthews Expressway. In 1962, it was in downtown Jacksonville at the junction of US-1 and US-17. My original design of this trip proved to be too simple for reality, which is not surprising because it was also rather arbritary. I wanted to do one episode every other week for a year, so I divided the 1444 miles of US-23 by 26 weeks. This gave me approximately 56 miles per week. But, when planning and driving the routes, some days just simply were not interesting enough at that rate. So I combined a few and stretched a few and ended up with the journey we just took. Some days ended up at nearly double the original design, just to keep things interesting (I hope). So, you might ask, what’s next? Well, I’m heading out the beach, even though it’s not on US-23. I figure I can use a vacation. After that, I suppose I should start the next ROADTRIP-'62 ™ route! Jacksonville has an Amtrak station, so maybe I could take a train to my next starting point. The Prime Osborne Convention Center is located in what was once Jacksonville Union Terminal, so in 1962 I would have caught a train there. 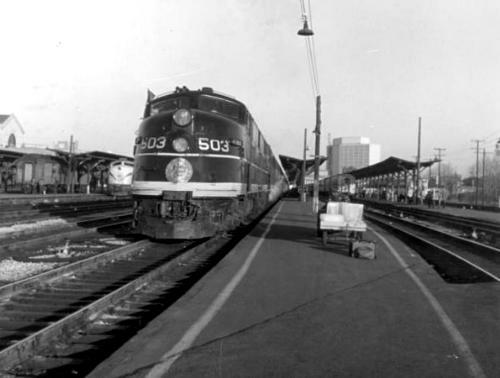 The last passenger train left in 1968. Amtrak now uses a station further out of town, and passenger trains no longer come to the old station, though CSX RR freight tracks still pass the site. I just had a thought about our trip: in 1962, could we have taken a train from Mackinaw City to Jacksonville? I’ll have to go research train schedules to see if that would have worked. How about a Greyhound bus, as Jacksonville also has a bus station? Maybe I could just "Leave The Driving To Us" as their slogan of that time commanded. I could have at least had breakfast at the station, as Traveler's Grille is located right inside. Or maybe I could take one of the other US-numbered routes out of town. The Coastal Highway, US-17 runs south of here to Punta Gorda, Florida and north up to Virginia. Hurricane Charley traveled up this highway in 2004 through Florida, South Carolina and Virginia. US-90 starts three blocks from the Atlantic Ocean just 20 miles east of here and ends up in Texas. Despite the "0" in its number, which usually denotes a coast-to-coast route, it falls short. Of course, US-1 could take me down to Key West, Florida or north to Maine to begin another trip. Or I could even run right back up US-23 and start all over again from Mackinaw City! There are two other US-numbered highways that begin there. How about I just give you the hint that one of these roads I just mentioned passes within 120 road miles of our next starting point? I’ll give you three hints and make a contest out if it. The next ROADTRIP-'62 ™ route is an east-west route, and it begins on the Atlantic Ocean coast, where I’ll be ending the day. If you can guess the next route correctly before February 27, 2012, I’ll send you a free ROADTRIP-'62 ™ ceramic coaster! Just send your guess here, and include your e-mail address. Between now and when I return for the next journey, please send in your comments on this one. Let me know of places that you think should be added or removed from the trip. Let me know about the quality of various places on the trip. Any information you have on US-23 and any memories from 1962 will also be appreciated. Locations of old gas stations still in operation will really be appreciated! I’ll try to get some gas before I leave town, but as you’ve seen, that’s not easy. I did see one station on our way in that appeared older, White & Son Service Station at Myrtle Avenue. Now, if it’s still open I’ll be lucky. Out to the coast I go now, probably to Jacksonville Beach, one of many 1962 cities that is now part of Jacksonville. Maybe today is February 20, May 24, or October 3, in which case I can watch the launch of a manned rocket from the beach. On each of those days, NASA launched a mission from Cape Canaveral, only 150 miles south of here. I think after that, I’ll just fly up to my next starting point. But whatever I do, I’ll see you on the next ROADTRIP-'62 ™ next year, where we can see some more sights, read some more news, eat some more great food, listen to some more music good, travel some more highways and just have some more fun as if it’s still 1962!